New York : Harper Paperbacks, 1990. This is the first Harper Paperbacks edition of The Fly on the Wall. It includes a chapter from the (then) forthcoming work by Tony Hillerman, Listening Woman at the end of the book. There is also a black and white photograph of Tony Hillerman by Barney Hillerman reproduced on the inside of the back cover, with an accompanying biographical note. [i] advertisement, [ii] books by Tony Hillerman, [iii] title page, [iv] imprint, copyright, printing run, [v] author's note, [vi] blank, [vii] fly title page, [viii] blank, 1-338 text,  divisional title page for chapter of Listening Woman,  blank, 341-353 text of Listening Woman,  blank, [355-360] advertisements. Binding: Laminated card stock with embossed, full color cover art by Peter Thorpe. 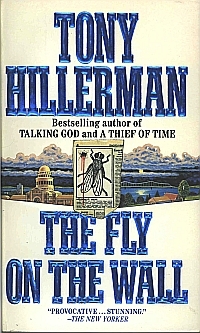 The Harper Paperbacks logo and ISBN are printed on the inside front cover, and there is a black and white photo of Tony Hillerman (Photo Credit: Barney Hillerman) on the inside back cover. Collation: [i-viii] 1-338 [339-340] 341-353 [354-360].